With its 24.3MP X-Trans CMOS III sensor and the latest X Processor Pro engine, the X-Pro2 has a performance to match its gorgeous design. Furthermore, although the model currently only offer Full HD video, Fujifilm is very generously making 4K video a possibility through a forthcoming firmware update. Once again the construction is reassuringly robust, thanks to a four-sided magnesium alloy build. A cool and unique feature is its eye-level ‘hybrid’ viewfinder, which means that a traditional optical and 2.3million-dot electronic viewfinder are visible within the same window. As a best-of-both-worlds approach, it’s a very neat trick indeed. The tactile rangefinder-type layout, whereby controls are large and prominently placed on the top plate, positively encourages manual control and experimentation. The flip side of this is that some familiarisation is required; unless, that is, you previously owned the quirky X-Pro1. Unlike its slightly sluggish forebear, the camera is swift to determine focus on its auto setting and fast to write even the highest resolution 24MP images to the card. Undoubtedly there still are some quirks and limitations, including common complaints like purple fringing cropping up in areas of high contrast, though overall we're very pleased with the level of punchy detail delivered. Furthermore, thanks to Fujifilm’s Film Simulation modes, which sounds slightly perverse in the digital era, you also get to treat images with a range of styles that mimic popular emulsions, such as the portrait-friendly Astia and the Velvia option that's long been a smash among landscape photographers. 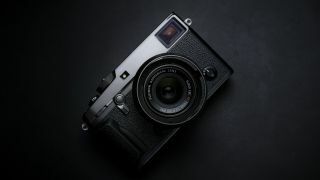 In summation, this X-Pro2's biggest draw is its 24MP APS-C sensor and a processor that's four times faster than the one inside the previous X-Pro1, together with that clever eye-level hybrid viewfinder. It’s a sound choice for enthusiasts who can stretch to the body-only price tag, and very much feels like a camera constructed to stay the course.